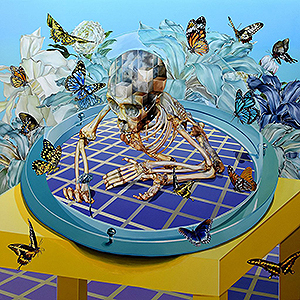 (Los Angeles, CA) – Thinkspace is pleased to present new works by Cuban-born painter Juan Travieso in Entropy. Currently based out of Miami and New York, Travieso creates visually complex worlds suspended in a state of fracture. Dismantled into seismic shards, these fragments are subject to the disorienting effects of constant spatial interruption. Combining a realist painting technique with surreal juxtapositions, spatial splicing, bright palettes, and geometric abstraction, Travieso conveys the textures of a universe in breach, distorted and split by its endless potential for loss. Fascinated by the extinction of countless endangered species and the often irrevocable influence of human intervention, Travieso presents the reality of a world in transition. His compositions often look like digitized renderings, informed by the awkward, artificial simultaneity of 3-D models, and devolve in moments to pixelated digital facsimiles, reminding us of the unavoidably temporal nature of disappearance. Travieso was born in Havana, Cuba. He credits his love of color in his work to the scarcity of resources in his home country, a stark contrast to the sheer availability of art supplies and imagery in the US. Inspired by this profusion of access to information and paint colors, the artist has taken on a series dedicated to endangered bird species, capturing them on the cusp of imminent disappearance. In the works, their facets are compartmentalized into geometric patterns and their edges striated to dissolve into quasi-architectural grids. A requiem of sorts for the irremediably compromised state of our biodiversity, Travieso’s paintings capture the cataclysmic energy of its decay and the transience of this biological exhaustion and loss, proposed in stark contrast to the permanent ambitions of the digital age. This re-articulation of environmental damage through the visual and graphic language of digital culture gets at the fundamental contradiction between the organic and the artificial, the finite and the infinite; the natural world is forever at odds with the perpetuity of artificial, manmade technologies. As an activist and environmentalist, Travieso hopes that his dynamic works will draw attention to the ecological carelessness we’ve abetted and the necessity of our continued vigilance in the preservation of what’s left. This compassion for the vulnerable and voiceless has clear political affinities for Travieso, relating to his personal experiences growing up in Communist Cuba where persecution for perceived dissent was a constant threat and the silencing of censorship unavoidable. Perhaps in keeping with this tendency to combine oppositions like freedom and constraint, Travieso depicts the lawlessness and diversity of nature at odds with the enforced geometry of human constructs. (Los Angeles, CA) – Thinkspace is pleased to present Stay Connected, featuring new works by Phoenix-born painter Wiley Wallace. Playful and ambiguous, his luminous and ostensibly radioactive worlds suggest a metaphysical interest in the possibility of alternate realities: the endlessly shapeshifting and protean nature of fantasy at the intersection of the imagined and “real.” Wallace’s paintings combine realistic rendering with elements of the surreal, and near-magical references that include eerily cast light sources bordering on the supernatural. Playful and macabre, his works combine intense thematic contrasts between light and dark to achieve suspense and evasion. Children are a recurring theme in his compositions, representing a kind of primordial link to something invisible and beyond comprehension, exempt from the rationalizations of the adult. Often using his own children as models, Wallace’s narratives are open-ended, filled with suggestion and partial disclosures rather than forceful assertions or posited certainties. The themes of connection and communication resonate throughout Wallace’s imagery, as the works’ protagonists seem ever in search of fugitive contact. The skeleton is a recurring figure throughout Wallace’s imagery as well, appearing at times as a sinister harbinger of some kind and at others as Halloween costume level kitsch. Wallace’s pieces convey a kind of sci-fi nostalgia harkening back to a Spielberg-era of extraterrestrial-themed filmmaking. At times their implied innocence and naiveté give way to darker and more dystopian readings, surfacing amidst the neon-hued glow.